On a Saturday morning in early February, with six inches of snow covering the ground and temperatures hovering around 20 degrees, a group of 25 adults in puffer jackets piles into a yellow school bus for a tour of Milwaukee. Instead of buzzing through breweries or stopping to admire Cream City architecture, the driver follows a route through Milwaukee’s once-redlined neighborhoods — the parts of the city that banks and insurance companies refused to serve on the basis of race until the Fair Housing Act of 1968 outlawed the practice. Before hopping on the bus, our group meets in the conference room of Town Bank in the southside Walker’s Point neighborhood. Adam Carr, one of our two tour guides, connects his laptop to a screen and begins clicking through a brief presentation. One slide displays the Wikipedia definition of redlining — ”the practice of denying services, either directly or through selectively raising prices, to residents of certain areas based on the racial or ethnic composition of those areas.” Several slides show black-and-white photos of Milwaukee’s historically black neighborhoods from the 1930s, ’40s and ’50s, depicting bustling main streets and thriving storefronts. 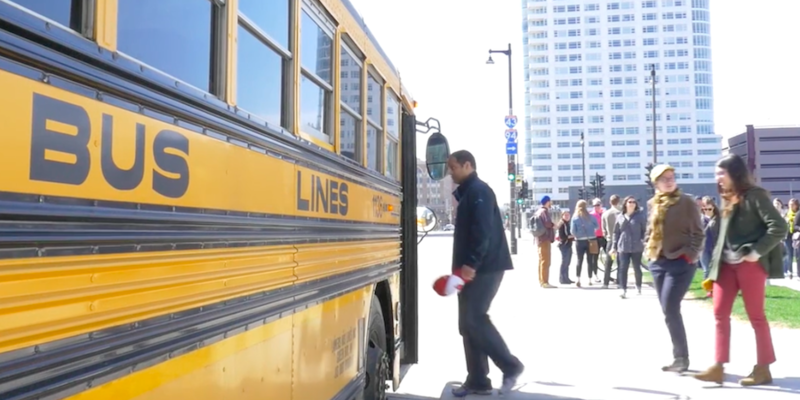 The redlining bus tour is part of a series Carr calls Milwaukee Tours for Milwaukeeans, which endeavors to give Milwaukeeans a deeper understanding of their city. A lifelong Milwaukeean himself, Carr got the idea during a stint producing radio segments about Milwaukee neighborhoods. 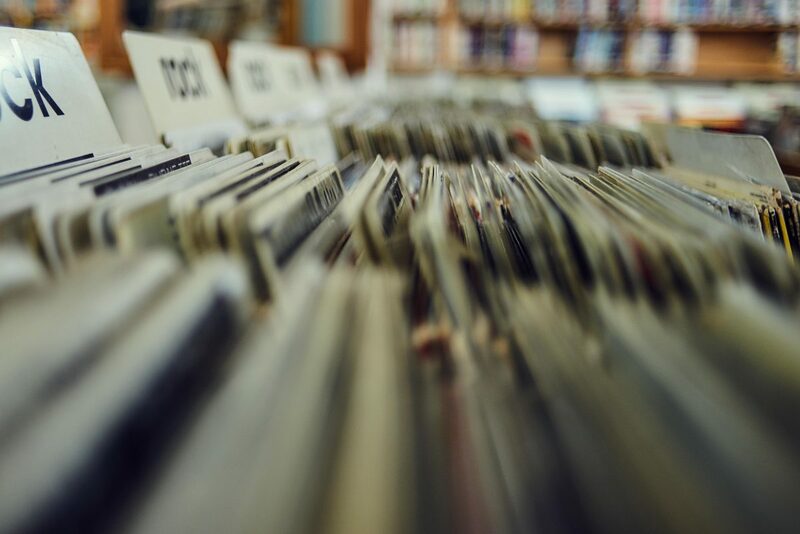 But while Carr spent most of his time in the field with people from across the city, he worried that his work might make some listeners complacent. Carr is not the only local using interactive tours as a means for educating Milwaukeeans about their city. Reggie Jackson, head griot (docent) of America’s Black Holocaust Museum, located in Milwaukee, offers “segregation tours” that focus on the intersection between segregation and the loss of Milwaukee’s manufacturing jobs starting in the 1960s, which led to many of the abandoned, boarded-up factories and homes still sitting vacant today. Jackson considers himself a “public historian” — by helping locals better understand history, he hopes they gain a deeper understanding of modern segregation that isn’t rooted in stereotypes. The risk, says Jackson, if you’re not careful about offering historical context, is that these types of tours devolve into poverty tourism. When the bus leaves Town Bank, we drive along Walnut Street through the Bronzeville Business District for an “after” view of the black-and-white “before” photos we saw in the bank conference room. Carr points to vacant lots and apartment buildings where black-owned businesses and clubs once stood. 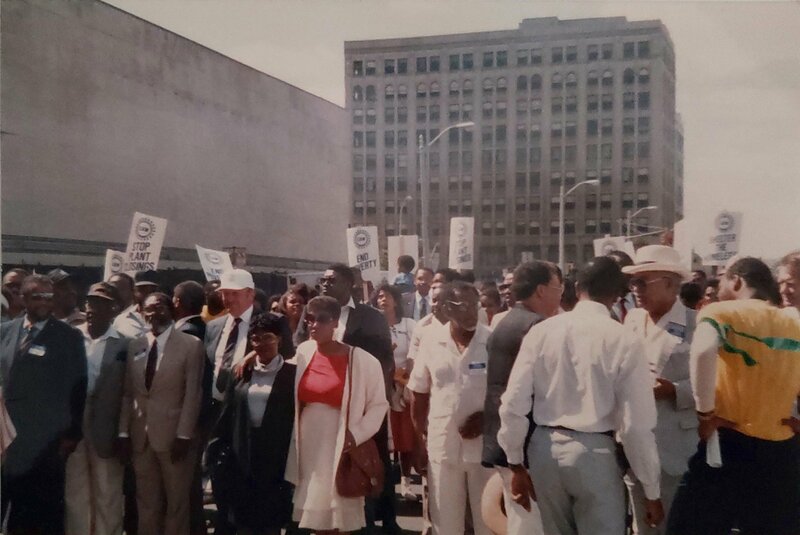 We make a stop in the parking lot of Columbia Savings and Loan, the first African American–owned savings and loan association in the city, founded by Ardie and Wilber Halyard to help black residents secure loans at the height of redlining. For many aspiring black homeowners in mid-century Milwaukee, Columbia Savings and Loan was the only place to turn to, as other banks adhered to “residential security maps” designed by the FHA-back Homeowners Loan Corporation (HOLC) in the 1930s. HOLC created these maps with the help of local mortgage lenders and real estate appraisers. The maps used color coding to rank neighborhoods based on risk and credit worthiness: green (“best”), blue (“still desirable”), yellow (“definitely declining”) and red (“hazardous”). Residential security map of Milwaukee from 1938; compiled from official records and drawn by Maurice Kranyecz; published and sold by David White Co., Inc.; prepared by Division of Research and Statistics with the co-operation of the Appraisal Department Home Owners’ Loan Corporation. In Milwaukee, as in other cities across the nation, black and immigrant neighborhoods consistently received the worst ratings. 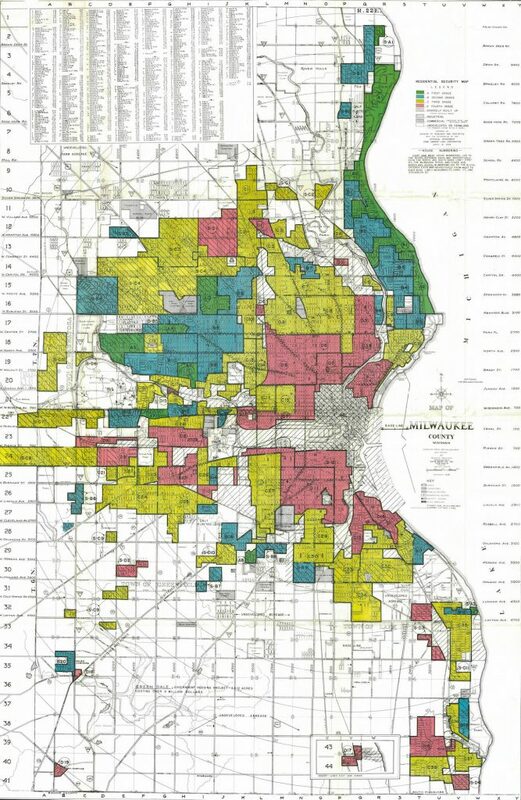 Paired with racially restrictive covenants that barred black residents from buying property in the suburbs, redlining intensified segregation throughout the U.S. and made it nearly impossible for African Americans to obtain mortgages, thereby stunting their ability to attain and grow wealth. In addition to color coding, each neighborhood map came with a qualitative summary. Our next stop is a few blocks west where we meet Ariam Kesete, a young black developer who is converting a dilapidated building in the Washington Park neighborhood into a start-up incubator. We file into the vacant building, which is currently stripped down to its studs and undergoing repairs for water damage. The space will house accounting, marketing and health care services for small business owners, along with a coffee shop. Kesete tells the group she wants the incubator to nurture entrepreneurs from the neighborhood. “We’re creating a hub for people to have a startup business so they can grow and then relocate elsewhere as the neighborhood gets up to speed,” she says. 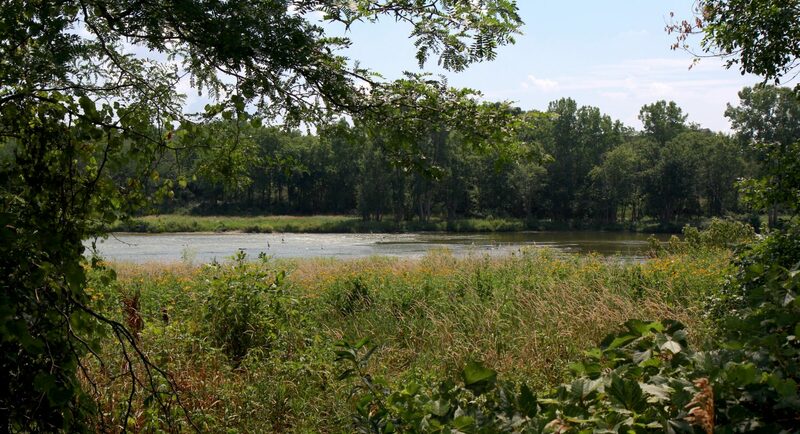 By supporting the residents of Washington Park, Kesete hopes to mitigate any risk of gentrification, which could displace the immigrant families who live in the neighborhood today. Altoro says the key to avoiding gentrification is supporting developments that are “favorable to the culture and the race of the people” already living in the neighborhood. He cites Chicago’s Pilsen neighborhood, a Mexican enclave, as an example of a thriving local economy. He starts naming local businesses, art museums and dulcerías (Mexican sweets shops) as evidence. The tour wraps up back south in Walker’s Point, a historically Hispanic neighborhood that is often described today as “up-and-coming.” It’s home to some of the city’s most expensive restaurants, cocktail bars and loft apartments. Altoro was born and raised on the south side. His grandfather was one of the first Mexicans to arrive in Milwaukee in 1915 to work at the Pfister & Vogel leather tannery. His grandfather also had 17 children in Milwaukee — Altoro credits him with the early growth of the Mexican community here. “If I were to run for office I would have an amazing built-in constituency,” he jokes. The bus pulls up to the block where Altoro’s grandfather lived when he first arrived in Milwaukee. 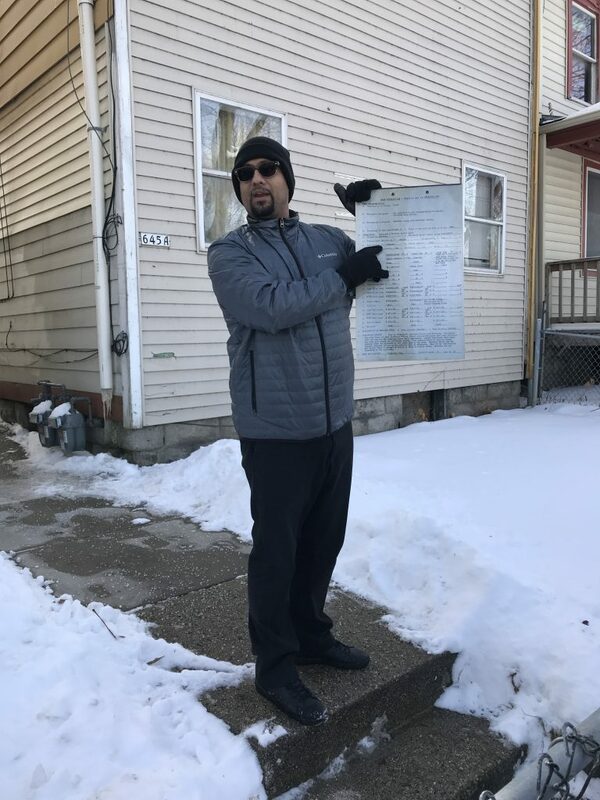 Altoro holds up a blown-up poster of the redlining map description for District 11, where our group now stands. The tour doesn’t conclude with a neatly delivered summary or a call to action for the group, which is mostly white and ranges in age from Millennials to Baby Boomers. 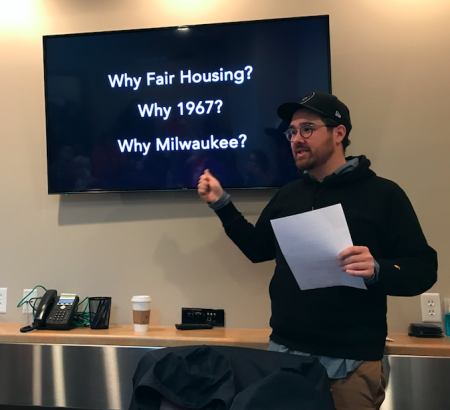 What matters to Altoro is that on this tour, he had the opportunity to tell Milwaukee’s story of redlining in his own words, alongside Carr, who is biracial. “It gives us the ability to have more normal interactions, where you just deal with people based on your shared humanity and you don’t look at people from this perspective of a stereotype,” says Jackson. For Carr, he hopes the people who attend his tours leave with a heightened understanding for how the city’s past directly shaped its present. He hopes people pause to consider the complexity of Milwaukee’s history the next time they read a headline. To support more journalism made by and for the Rust Belt, become a member of Belt Magazine starting at just $5 a month.